Love the piles of felt that act as resting spots for conference-goers. Simple wooden frame positioned at eye level by Superdry allows passersby to peek inside and encourages people to wander inside….all for half the cost of materials. 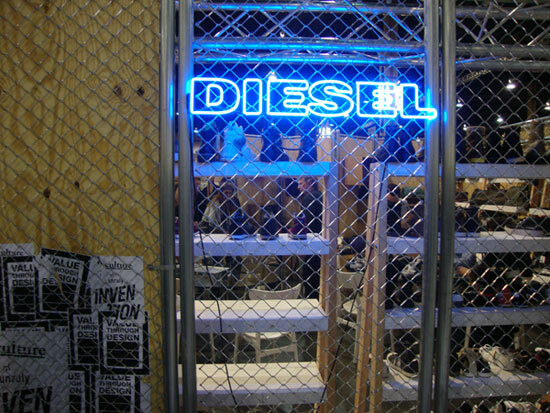 Diesel creates an urban look complete with posters, neon and a chain-link fence. Not only is the fencing cheap, it allows people to peek inside and see the goods. My favorite. Hands down. 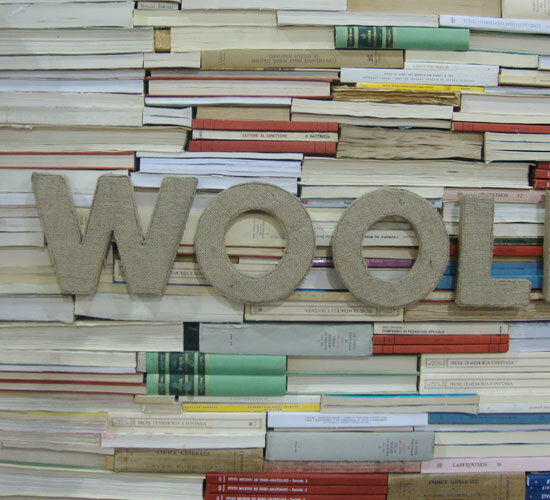 Woolrich‘s stacks of books added color, texture and give the traditional brand an edge. The insides of the booth were papered with pages from books. Love this! Cafe Bustelo served complimentary espressos to fashion folks in the Workroom showroom. 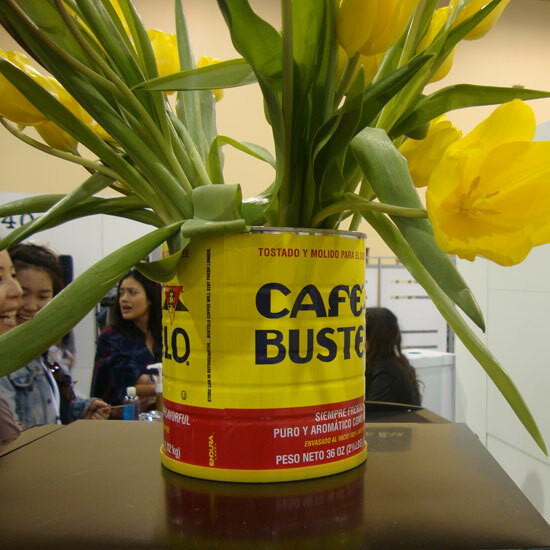 This has nothing to do with booths, but I loved the yellow tulips in the Bustelo cans. They brightened up the back end of a showroom and beckoned tired peeps. A designer literally pokes holes in a model’s shirt, designing on the fly before an impromptu shoot. 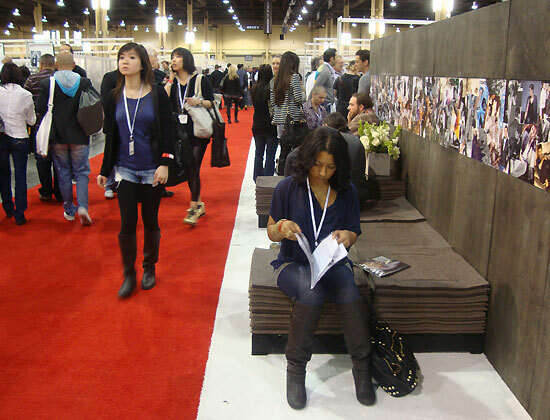 Note the wooden booth structure…a bit trend this year. A super creative, ‘live’ booth design by Big Star. They wallpapered both the interior and exterior with dollar bills. On the exterior, the bills formed large blank spaces spelling out the name of the brand. During the trade show, employees carefully peeled the bills off the walls and dropped them into a bin to be sent to Haiti earthquake victims. Great idea. 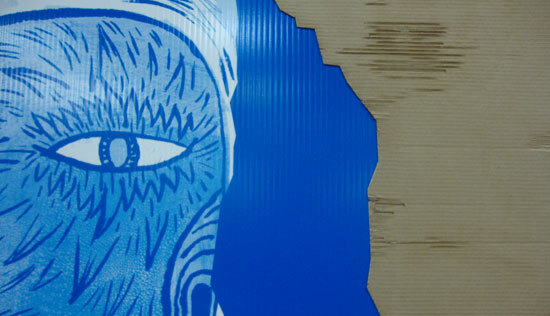 A mural is outlined by cardboard. Cheap and common becomes modern and clever. When I was a pre-teen (tween, whatever), I was *obsessed* with Tretorns. I would literally wear a pair until I could see my toes peeking out from the sides. They naturally ended up covered in drawings, friends’ names, etc and my Mom had to rip them off my feet (esp if there was snow on the ground) and force me to wear ‘normal’ shoes. Ick. 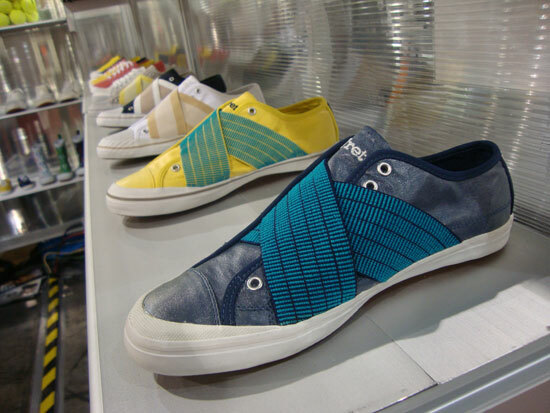 Well, I spotted the Tretorn booth and fell in love with these elastic sneakers. Hopefully, I will soon own a pair of my own! Have you seen any creative ways to beat the recession in window displays or catalogs?